The 2013/14 season will be remembered for its unpredictability. 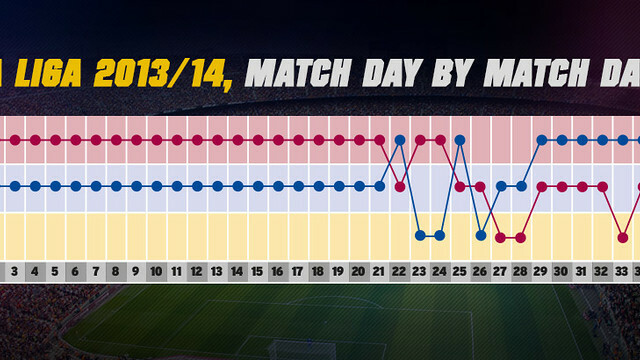 Barça, Atlético and Real Madrid have made the last nine months exciting and uncertain. Now, with only one match day left on the calendar, only two teams can win the title. They are Barça and Atlético, the two most consistent teams in the league this season. The start of the league didn’t foreshadow the nail-biting finish that the end of the season is proving to be. A very strong Barça went on to win their opening eight matches, and secured a total of 54 points in the first half of the season. The Blaugrana sat atop the table through week 21 of the competition. In total, it took Barça’s streak as leaders of La Liga to 59 consecutive weeks – they held the top spot from the first week of the 2012/13 season through the 21st week of the 2013/14 season. On February 1 Barça amazing run came to an end. A 2-3 defeat at home against Valencia made Atlético Madrid leaders, the Colchoneros had defeated Real Sociedad by 4 to 0. One week later Atlético dropped points against Almería. Barça, who defeated Sevilla (1-4) and Rayo (6-0), returned to the top of the table for two weeks. A new team took control of the competition on week 25. Defeats handed to Barça and Atlético, against Real Sociedad (3-1) and Osasuna (3-0), respectively, allowed Real Madrid to take control of the top spot for the first time since the 2011/12 season. Los Blancos enjoyed their position for four weeks, until they were defeated by Sevilla 2-1. Atlético Madrid took advantage of Real’s defeat and regained the top spot, a position they haven’t relinquished to date. Barça, who won at the Bernabéu (3-4) but lost points to Granada (1-0), Valladolid (1-0), Getafe (2-2) and Elche (0-0), came into the final stretch of the season on irregular form. Similarly, Atlético Madrid and Real Madrid also dropped points to Levante (2-0) and Malaga (1-1) and Valencia (2-2), Valladolid (1-1) and Celta (2-0), respectively. The series of of missteps by the top three times eventually left Real Madrid without any chance of winning the title. Barça and Atlético Madrid, on the other hand, are separated by only three points. An FC Barcelona victory at the Camp Nou over Atlético Madrid would mean a changing of the guard at the top of the table. There are 90 minutes left in the 2013/14 league campaign, more than enough time for another team to take over at the top in this highly unpredictable year of football.